This EP from Spain’s Incursed is their first release in two years to the day since the triumphant Fimbulwinter which I listened to many times. There is a total of 5 songs here, two new tracks (“Beer Bloodbath” and “Raging Wyverns”) from their upcoming album Elderslied, a re-recording of an older track (“Die By The Sword”) a cover of the “Game Of Thrones” theme and then a “drunken” version of “Beer Bloodbath” to close it out. 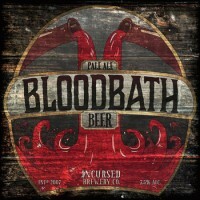 “Beer Bloodbath” reminds me of more melodic metal version of an Alestorm song played by Equilibrium. The title of the song screams for a killer chorus which unfortunately is not here but a great catchy song nonetheless. “Raging Wyverns” starts with some killer Spanish influenced guitar work right into some tasteful riffing, crushing vocals and keys showing a real maturity to their sound and songwriting, hoping the new album has more of this from them!! You can definitely hear their maturation after listening to the redone version of “Die By The Sword” which is also a great song but is a little more straightforward. The theme from “Game Of Thrones” is also a nice addition to the EP which shows their musicianship in tackling this song-one that definitely deserved a Viking/Folk metal treatment. The EP closes out with an alternate version of “Beer Bloodbath” where the vocals are different (I assume “drunkenly” so) really sounding like an Alestorm song here!! Production wise this really has a more warm, well-rounded sound (instrumentation not as buried in the mix, better blending of vocals, etc) then Fimbulwinter had so the hopefully the new album will pick up where this EP left off with more of the growth they have exhibited in the last two years…..